Portobello Road. A road in Chelsea where everything feels magical. One of the many magical spots in the area is Farm Girl, a cute little spot in a tiny corner of Notting Hill. I’ve heard so much about their rose lattes I just had to try it for myself. So down we went on a cold Spring afternoon, for a post brunch brunch! (Standard Sunday tradition). Usually, when its brunch time, I’m starving! No breakfast makes me rather hangry but its totally worth it, I’d rather stay hungry and enjoy the food to its’ full potential. My friend and I ordered some lattes, Blueberry pancakes, Baked Eggs and Sweet Potato Fries. It was a Sunday afternoon and the little cafe was really busy, we waited almost 40 minutes and our food had still not arrived. When we asked the waiter, he said that there had been an error and the order hadn’t even been put through! I was so hungry at this point, I had to compose myself when the waiter told us that they were taking last orders and we still had no food. The cafe was almost empty at this point. 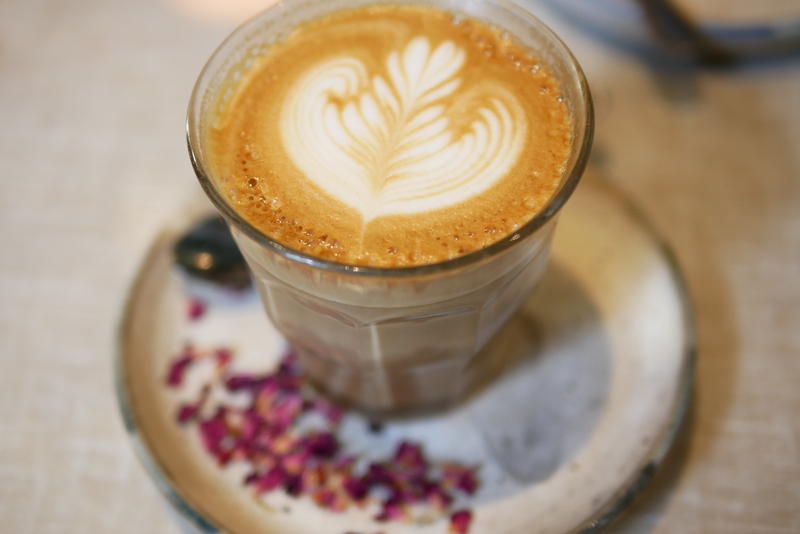 The Rose Latte was as pretty as I had seen on Instagram.. although it was obviously made in a hurry as the coffee was so strong that it was almost inedible. 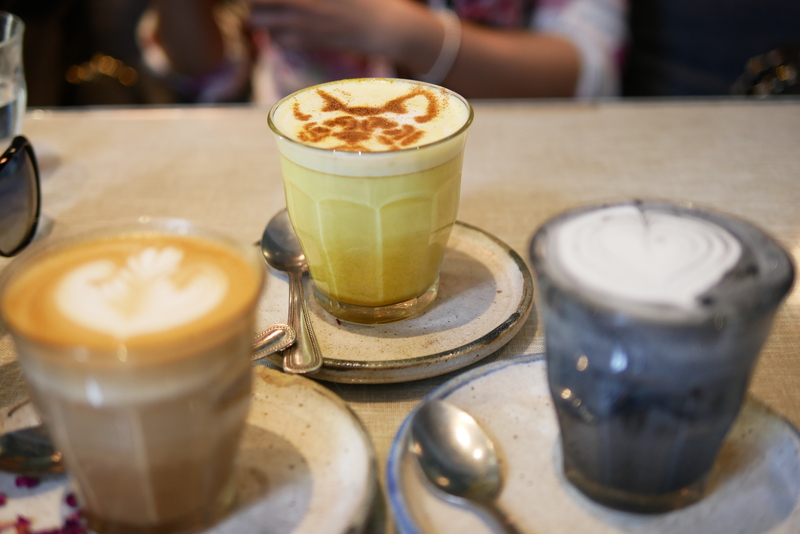 The Liquid Gold latte, turmeric flavour tasted less of coffee and more of turmeric milk. Surprisingly, the charcoal latte was the best of the lot. The Black Latte’s art was a half-assed attempt, but was actually the best of the 3 lattes. The buckwheat pancakes were amazing. They were light as air and just melted in my mouth. 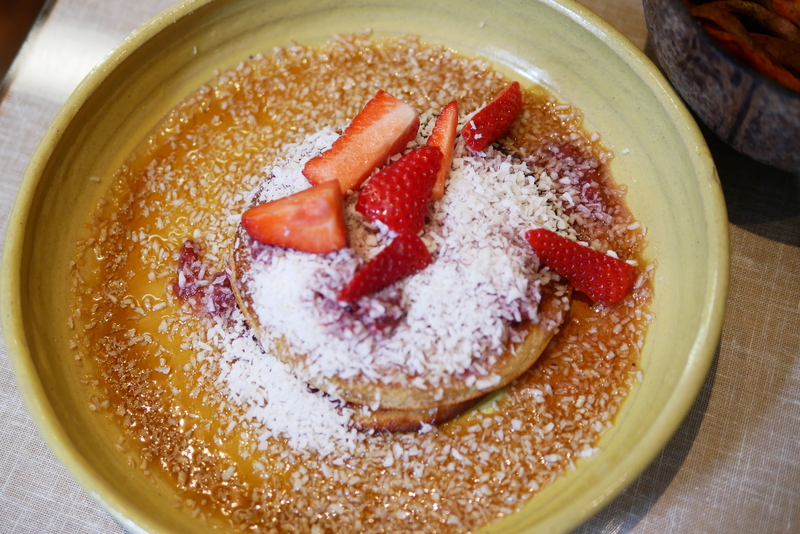 The generous portions of coconut shavings on top, as well as the amber maple syrup lathered over the pancakes made for some of the best pancakes I’ve had. 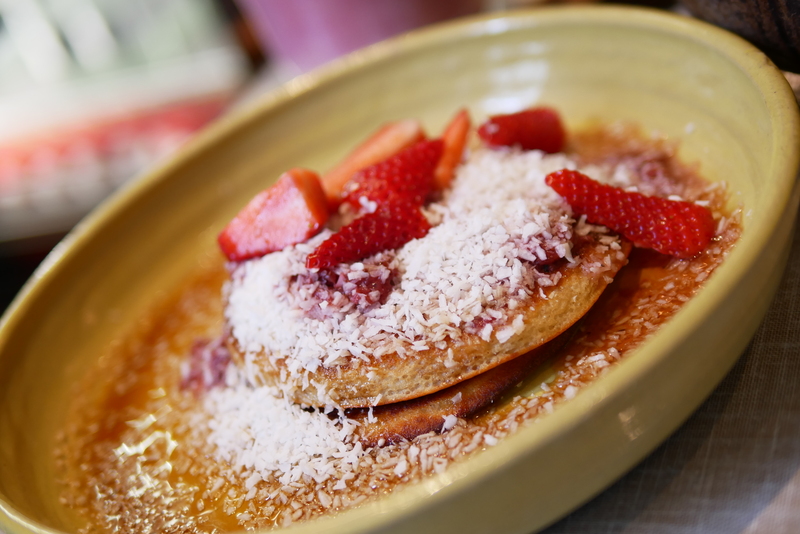 Moreover, it didn’t feel like a treat, the pancakes were so light they almost felt healthy! Every bite was a delight. 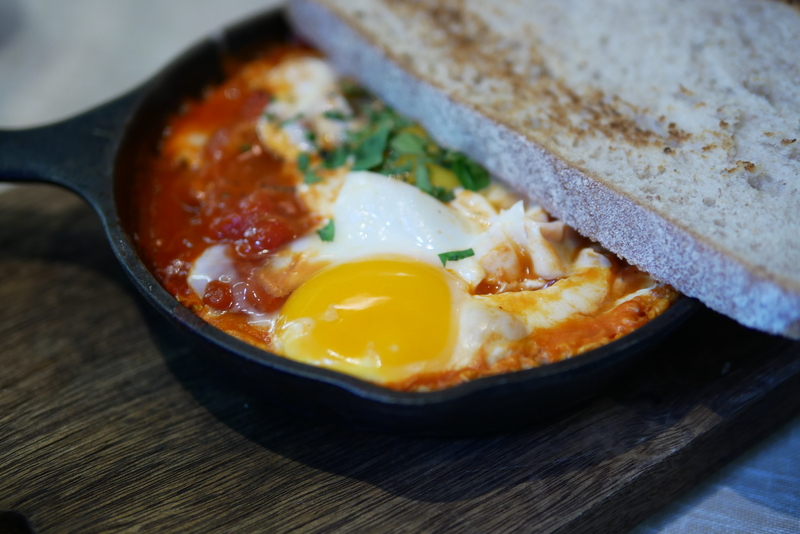 My friend ordered the Oven Baked Eggs – Turkish eggs traditionally baked in a tomato, red pepper & parsley sauce. Eggs baked in tomato sauce and cheesey bits, although it felt so fresh and healthy. A much better options than eggs benedict. The service was rather disappointing, and by the time we finished our meal they were ready to close the shutters to the restaurant. Due to the long wait we had to face, they discounted the bill a little, either way it was definitely affordable and a good option for brunch if you’re in the area. Overall, despite the service, the food was definitely much worth the hype, although the coffees not so much. Apart from being Instagram-worthy, the lattes were not much else. Overall, giving Farm Girl a total TLH score of 6 out of 10. Halal Status: Not halal but plenty of halal-friendly options.